Payet Vacances SL is the owner of the website "payetvacances.com." Payet Homes is a company offering through this website ( "payetvacances.com") the rental and sale of properties. 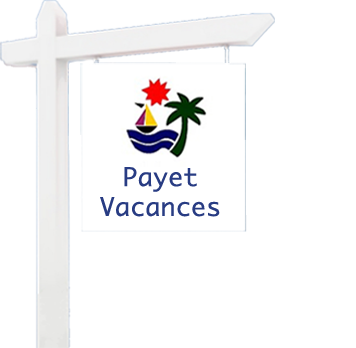 The information is indicative and may have variations in no case can this information be considered as a firm offer until the customer has not received confirmation Payet Vacances SL. Payet Vacances SL owns the website www.payetvacances.com and owner of intellectual property rights of this page and all contents thereof and the domain name www.payetvacances.com . This entire website: text, images, trademarks, logos, buttons, software files, color combinations, as well as the structure, selection, arrangement and presentation of its contents are protected by Spanish and international laws on intellectual property. The intellectual property rights of the websites to which the website can redirect Payet Vacances SL as well as the ownership of domain names and content of these correspond to their owners. It is forbidden the total or partial reproduction of this website and any of its contents without the express written Payet Vacances SL. Expressly prohibited any web page that contains a link to mention www.payetvacances.com or its contents remain the frames of the source page, because its maintenance leads to user confusion about the ownership of contents of this page, representing also a violation of the right to intellectual property of this website. That is why the user should know that they are entering into this website and receive in your browser the URL address of that website. Payet Vacances SL is the owner of the website www.payetvacances.com. Once completed the form of information request, the user accepts that personal data will be incorporated into an automated file created by Payet Vacances SL, which aims to keep the user informed about products offered by this website. In any case the user will be responsible for the accuracy of the information provided at the time of submitting their request for information. According to the current legislation regarding the protection of personal data, Payet Vacances SL is committed to fulfill the obligation of professional secrecy regarding the data provided by the user and the duty to protect them, ensuring confidentiality and adopting, where appropriate, the appropriate technical measures to avoid any alteration, loss, misuse, unauthorized access and theft. Personal data provided by users will not be disclosed to any person and will only be used to send you information about products offered Payet Vacances SL. Personal data provided by users at any time not available to third parties. Payet Vacances SL is not responsible for the contents of Web pages that can redirect www.payetvacances.com, nor of any breaches of legislation in which these pages may incur. Payet Vacances SL is not liable for direct or indirect damages arising from the use of this website or its contents, including computer damage and the possible virus information.